June 2013 | Free Pc to Phone Calls, Free Voip Calls to India International ! Smartphones are really very popular now. A lot of people are using internet on mobile or atleast on their computer. However the fact is that huge number of people still use their regular phones to make international calls. If you are calling countries like USA, Canada, UK, Mexico, Philippines, Sweden etc using your mobile (regular telecom service) then trust me you are paying huge bills and definitely losing too much money. We will today review a voip service names "WebCallDirect" which can help you lower your phone bills by allowing you to make international calls using internet. Not only we will review this voip service but we will also post a step by step tutorial on how you can use WebCallDirect on your computer to make free pc to phone calls. Its international calling rates are also very competitive specially for countries like India but good thing is that it offers free calls to many countries. 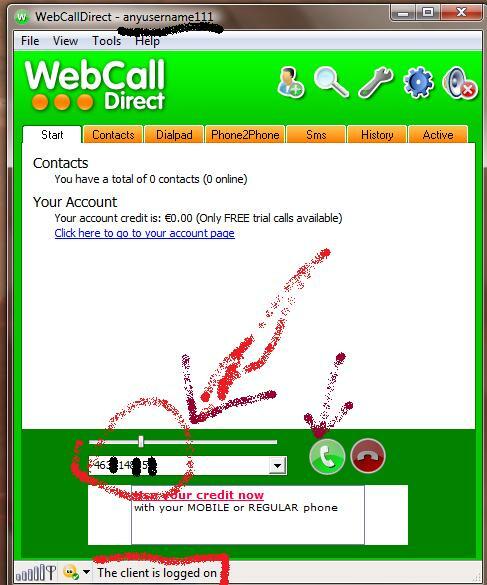 Check out some positives and negatives about WebCallDirect! Negative: Its a betamax company which has bad reputation, not to be trusted. Some people recharged and lost money. Check other betamax companies. As said above it offers free calls to many countries and call rates to other countries are also very cheap and competitive. You need to have some money in your account to be eligible for making free calls. According to them you need to have FreeDays in your account. If you have these freedays, then you can make free calls to some countries (listed below). Buying credit entitles you to 60 Freedays (unless stated otherwise). This means you can call all countries marked as "Free" for a period of 60 days at no costs. Once these days are over, you can buy more credit to get more free days. Rates are charged in eurocents per minute. Calls are rounded up to next minute. All rights reserved. Rates are subjected to change without notice. This is basically making free trial calls, so each call will last about 5 minutes. You can make unlimited number of calls. Make Pc to Phone calls using Softphone or Phone to Phone calls using SIP. 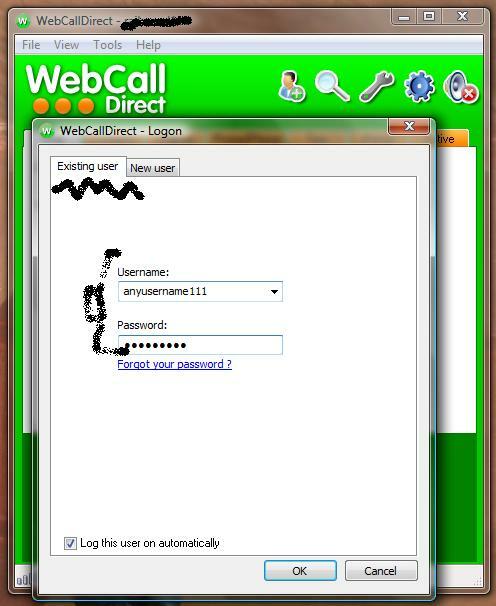 So with that, lets start with WebCalldirect tutorial with screenshots. 2. On the right sidebar (below) you will see link for "Download the Free SoftPhone". Click on download and download the softphone, install it. Its a PC application. 3. 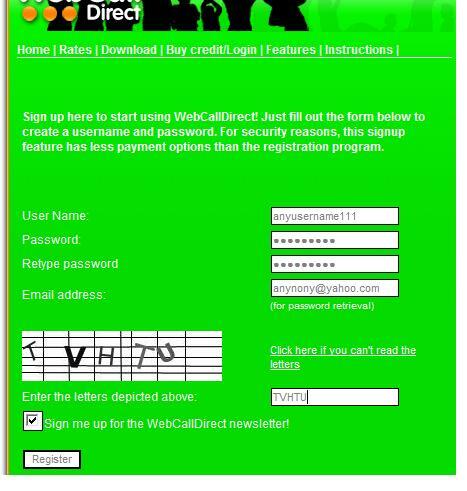 Sign up with webcalldirect, use the sign up link on website (and no need to register using softphone). Check the image. Fill any random email id. No need for verification/confirmation. 4. Now on the softphone, click file and then select Logon as another user (image clearly shows it). 5. Fill the details which you used for registration. Click Green button. Call will connect. If you get message like, you dont have enough credits, this means that the particular destination (mobile/landline) is not free. Now what..? Free Trial call over. How to make more free calls. Just Register again with different email ID, password. Follow the tutorial from Step3 again. 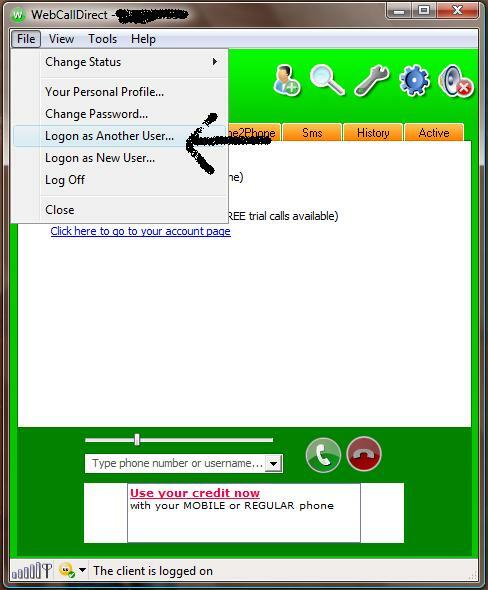 Trust me it will not take more than 20 secs to create new account (and one more 5 min free call). Please note that apart from making PC to Phone Calls, you can make Webcalldirect SIP Calls, also use Webcalldirect on your mobile, iPhone, Android, iPod Touch, Mac or Windows mobile. Note: It wont work for making free calls to India. Try other methods for making calls to India. All betamax services work on your mobile (smartphones). WebCallDirect also works on your android mobile and other types of smartphones - you basically need to install MobileVoip. Its a free application which enables you to use WebCallDirect on your mobile phone. Download MobileVOIP and log in with your WebCallDirect username. Read More about Betamax Voip SmartPhone App. If you still face any problem in making free international calls using webcalldirect, then post your comments. If anyone has bought a smartphone, then the next thing one wants to do is to install Viber on it. Those who have not yet got Viber installed on their mobile, are planning to start using it. The ones who are not having a smartphone are using Viber on their computer. In short Viber has grown pretty big and now everyone just want to use this cool app. The reason for its popularity is pretty simple - its feature of allowing people to make calls to each other for free (Viber to Viber is always free and all it requires is internet). Infact you don't need to add friends these are automatically visible from your address book (it figures out which of your contact are already on Viber). A lot of people have complained to us about the problems they are facing when installing Viber Applications. One such common problem which many people have faced or are still facing is related to get the app verified on their mobile - Viber Activation code on your mobile. The problem is common to users on Android, Blackberry, Nokia, iPhone, Windows Mobile and other types of smartphones. Please is a list of such issues - read them and follow the solution. We hope you should be able to get Viber working on your mobile. Note: Make sure that you are using the latest version of Viber on your mobile or computer. Q. Android Mobile/BlueStacks Viber on PC - I am not getting the Activation Code on my Mobile. What next ? Ans. Please note that the below solution works for both Android Mobiles and PC (by using Bluestacks software). So if you did not receive your access code via SMS, Viber authentication system will securely provide you with your Viber access code. 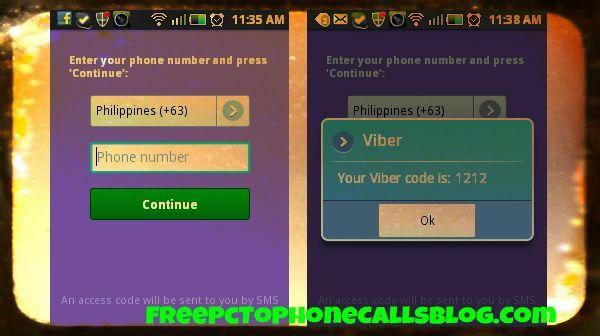 Actually Viber will give you a phone call on your mobile and read out the access code. Open Viber on your device. Go through the setup again, until you reach "Enter your phone number..."
Enter your phone number and tap on 'Continue'. If you haven't received an SMS with your access code within 60 seconds, click on the ‘No Code?’ button. Now Viber will call you on your phone. Accept the automatic call and write down the given access code. Enter the code into Viber to complete the set up. Note: You will NOT get the access code (activation code) via Email. The Access Code feature was created for identification purposes to protect our users' identity and ensure that they are the real owners of the number that they are registering. Receiving your Access Code via SMS will prevent other users from obtaining your access code and placing calls with your caller ID. Q. Viber Invalid Code Error - Common for all mobiles ? Ans. If you are getting the error that the activation code is invalid, then you will have to wait for some time and then re-enter the code. If it still fails to work then we would suggest you to wait for a day and install the Viber again (reinstall) and receive a new SMS code. If it still fails to work (and keep failing), then just follow the procedure described in step 1 (fail to get activation code). You may try to register to Viber with a different number (for example - your home landline number, a friend's number, etc. ), in order to determine whether the problem is specific with your number, or a general one. And. 1. First, please try uninstalling and reinstalling Viber when connecting to a few different WiFi networks (in order to pinpoint the source of the problem). What are the results? Ans. If you are from a blocked country where Viber fails to work (you are not able to receive sms and not even able to open activate.viber.com) then the only possible solution I could find is to use VPN (virtual private network) on your mobile. This is similar to using proxy. It will fool them and will be like as if you were from USA or any other working country(for iPhone use proxy settings). Also make sure to use the method described in step1 (receiving phone call and activating). If you are not able to get Viber working on your mobile (and facing any activation issue) - then please share with us in the comment section. May be we can help you out! Skype is the oldest (probably one of the first ones) voip provider and is highly popular. It was recently acquired by Microsoft and its user base is continuously growing. People use Skype on their computer, smartphones, tablet, Facebook - almost on all the device. Skype has its application for Android, iPhone, Windows Phone, Nokia, Blackberry (almost all mobile operating system). There is no doubt that Skype is really a good service (specially its video calling), however even with its so many positives and huge customer base, Skype is now getting tough competition from voip service named "Viber". Viber is again a multi platform voip service, now available for almost all the operating system (it even launched PC application recently). For those who are not aware about Viber - it is a simple mobile and PC app which allows you to make free calls and send text message (and video calls on PC) to a person who is also using Viber on his mobile/PC. Recently Viber published some numbers and we came to know that it has now been downloaded more than 200 million times. Viber is free and continuously growing, it is being considered as a Skype Killer. In this post, I have tried to compare the two voip services (and the future prospects of two) - Skype Vs Viber. However, here I have just looked at the points because of which I feel that Viber is better than Skype. There are some features of Skype which are unique to it and not present in Viber. I will soon write a post on it. This is the main reason I love Viber. Just download the application to your mobile phone and your mobile number becomes your username. No signup required. With Skype you need to create a user account. Since Viber does not require username, it simply scans your phone address book looking for phone numbers. So any of your friend who is using Viber will be visible to you (and you will also know who's online With Skype you need to add contacts - for that you need to know your friends Skype username. One of the coolest feature of Viber app is that it works in the background and does not have to be running in order to work. So even if you have not opened the Viber app, you can still receive calls on it. Skype on the other hand requires that you logon into the app before you can make/receive calls. Viber has a good range of emoticons which are quite vibrant and dynamic. I would say these are better than what Skype offers (but yes not as good as Whatsapp). I would Viber call quality (voice calls for mobile and video calls for computer) is pretty good. However when compared to Skype, I won't say it is better because Skype quality is itself awesome. This is the deciding factor - when connecting with friends and to keep in touch you will have to use what other's are using. For now the trend seems to be Viber - everyone is just switching to Viber (whatever the reasons are). So to stay connected and social - you have to use Viber! Please share your views on this. Are you using Viber or Skype or both. 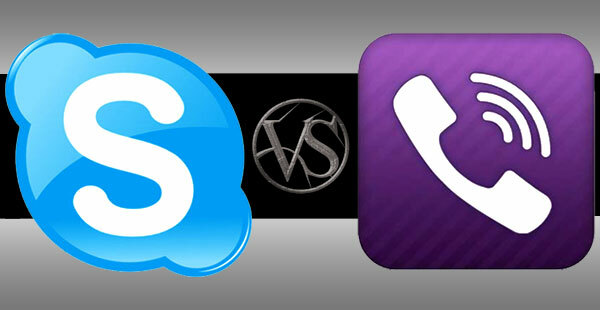 Which service do you like more - is it Skype or is it Viber ?